"A Loner" (大雪冬至) explores the life of a old woman in Beijing, illuminating a broader social phenomenon of "left-behind" elders in modern-day China. Drinking away yesterday’s sorrows with today’s liquor. While “reform and opening” has brought economic prosperity to China, it has also created a wave of social upheavals through the disruption of traditional ways of life. As young, ambitious individuals pursue career opportunities further and further away from home, they often leave behind their parents, and sometimes even their children. Director Xing Xiao explores the mundane, daily life of one such left-behind parent, Wei Daxue (Zhu Xijuan) in A Loner (大雪冬至). Living in a traditional “four-sided courtyard” house, where historically multiple generations would live together in one complex, Wei Daxue slowly finds her few friends in the world slipping away — an artist living in the guesthouse leaves, a neighbor dies, and her dog runs away. Her daughter is physically distant, and a cross-generational tension between tradition and the expediencies of modern life keep their conversations short. The film itself is not all that interesting — but that’s intentional. Xing Xiao treats his audience to a mundane, hour-and-a-half depiction of Wei Daxue walking along the same road every morning, buying the same baozi every day, and enviously watching younger ladies dance guangchangwu (lit., courtyard-dancing) by the side of the street. After her small dog runs away while she is napping, Wei Daxue has nothing to look forward to in life but her imminent passing. She spends her nights drinking baijiu alone, to the memory of her deceased husband; family portraits and memorabilia litter her now-empty household. 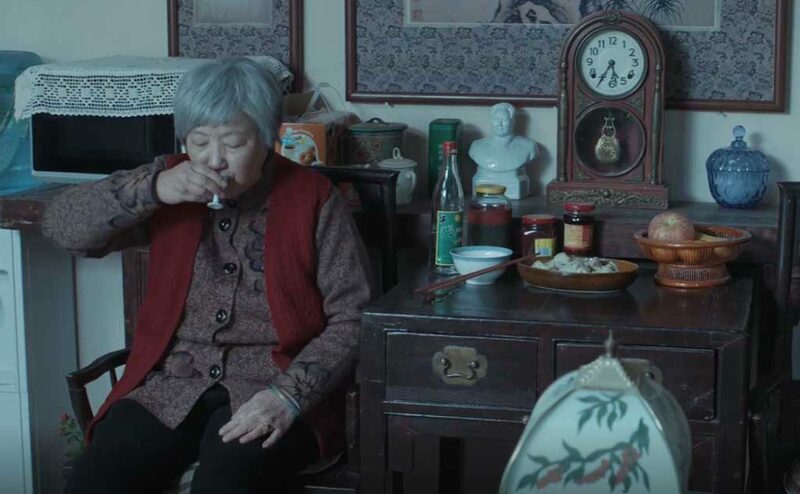 The backdrop of a bleak, wintery Beijing reflects Wei Daxue’s mood throughout the film — and likely the mood of millions of elderly Chinese left alone at home, left without purpose now that their children are grown. This feeling of purposelessness is especially acute in a Confucian society like China, where the relationship between parents and children is front-and-center for much of life. While today’s generation often offers financial support to their aging parents, emotional support is less forthcoming. Lonely elders are so big of a problem in today’s society that the Chinese government now even requires children to visit their aging parents. Demographics in China over the past half-century haven’t helped either, with the burden of both financial and emotional care for today’s grandparents resting squarely on the shoulders of a single child. However, in an increasingly competitive economic environment where wealth and opportunity are focused far away from people’s hometowns, is it reasonable to hold on to this traditional view of an elderly parent’s life? This may be one area where China could look to the West, where it’s expected that children will move out from their parents’ households, and even far across the country if not the world. In the west, adult children go far and wide for education, their own careers, and eventually their own families. At the same time, empty-nesters are free to open a new chapter in their lives and, while maintaining relationships with their own adult children may be one aspect of a fulfilling life, it certainly isn’t the only component. These empty-nesters might find fulfillment in new hobbies, pursuits that were difficult when devoting the majority of their daily life to raising children. With new-found financial freedom, empty-nesters could travel and explore the world in ways they couldn’t before — living active, fulfilling lives. The loneliness presented in A Loner left me wanting to call my own parents — especially considering I live at a 14-hour flight away. However, I also don’t worry about their happiness — empowered by a quick lesson in points-earning credit cards, my parents have found the time and freedom to travel the world in a way that I’m unable to for the same reasons that I am seven thousand miles away from them. A Loner (Chinese: 大雪冬至)–China. Dialog in Mandarin Chinese. Directed by Xing Xiao. Screened June 2017 at the Shanghai Film Festival. Running time 1hr 28min. Starring Zhu Xijuan.